A basket of assorted goodies, valued at approximately CAD $300, for the best Application by popular vote. Hack for Humanity is a female-focused hackathon with a welcoming environment for women to participate in a hackathon. Everybody is welcome; come together and create amazing projects! Hello Vancouver! Join us for the Girls in Tech x UBC Hack for Humanity. This hackathon will take place at The University of British Columbia from February 10-11th. Unique to Hack for Humanity, final hack presentations will take place at RED Academy prior to an after party. Expect prizes, food, and fun at the afterparty - complete with photographs to capture your experience. This is an event you do NOT want to miss! This is not your typical two-day hackathon. Hack for Humanity an event brought to you by UBC Department of Computer Science and RED Academy to deliver Vancouver's first female-focused hackathon! Everybody is welcome, we encourage diverse groups to come together and create amazing projects. Mentorship will be available during the hackathon from industry professionals. Prizes will be rewarded in the best categories - to be announced. Regardless of gender, age, or university you are welcomed to come! Hack for Humanity is a two-day event, without the need to stay overnight to complete your project. Participants can go home for a good night's rest before final presentations at RED Academy. Check in and attend our welcome ceremony at UBC on Day 1 to know when food is served and the rules to win awesome prizes! Come to RED Academy on Day 2 for judging, prizes, and an amazing after party. We encourage everyone (18+) to join! The best innovations are made by diverse groups. All we ask is to have at least one female in your group. Feel free to come with a group or alone - Girls in Tech will help you find a group if needed! Don't be afraid to come out, make friends, and innovate. Make sure to show your school spirit - wear some of your school swag. We want to show off the top tech talent across universities from the Lower Mainland! We are Girls in Tech - Vancouver, a not-for-profit that supports and leverages its global Girls in Tech counterpart. We focus locally on the retention of young student and professional females in the technical industry. Retention encompasses many facets including: well-being, integrated business and technical education, and in general, empowering women by fostering a supportive and encouraging technical culture. 4:30 PM Winners announcement - distribute prizes! 5:00 PM After party and mixer - party snacks provided! Space is limited so register ASAP. Remember you need to be over 18 to register. The Contest is open to residents of Canada (except Quebec) and the United States who are over 18 as of the start of the Event. 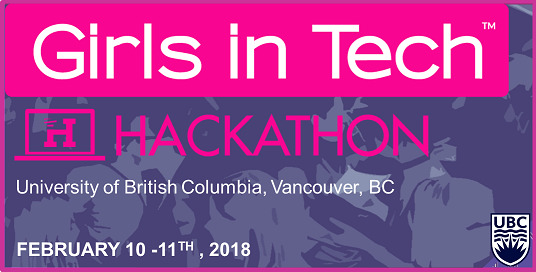 To be eligible, entrants must have registered on https://www.eventbrite.ca/e/hack-for-humanity-girls-in-tech-vancouver-x-ubc-tickets-42051499166 (the “Contest Page”) prior to the Contest Period and have signed the Waiver and Release provided by Girls in Tech-Vancouver Society. The Contest is subject to all applicable federal, provincial, state and local laws and regulations and is VOID WHERE PROHIBITED BY LAW. What problem does it try to solve? What was the inspiration behind the project idea? What is your stack? What language did you program it in? What API’s did you use? Which part was the most difficult to implement and why? What are the next steps to complete the project? Entrants must register for the Contest via DevPost and attend the Event. Entrants may work in team of two to five people, unless otherwise permitted by the Sponsors during the Event. All members of a team must be eligible for the Contest and in attendance at the Event. Entrants must work as a team to create an application that solves or ameliorates a problem in the community (the “Application”). Each completed Application must be submitted by 11:59am on February 11, 2018. To complete the entry process, each team must present and demonstrate their Application to the Judges (defined below) at 2:00pm on February 11, 2018 (the “Entry”). not include any malware, spyware, viruses, worms or similar harmful code or content. Any Entry that the Sponsors deem, in their sole discretion, to not comply with these Official Rules or to otherwise violate the terms and conditions set forth in these Official Rules will be disqualified. The Sponsors reserve the right to disqualify any entrant it believes to be attempting to tamper with or undermine the entry process or the legitimate operation of the Contest or to be acting in violation of these Official Rules.